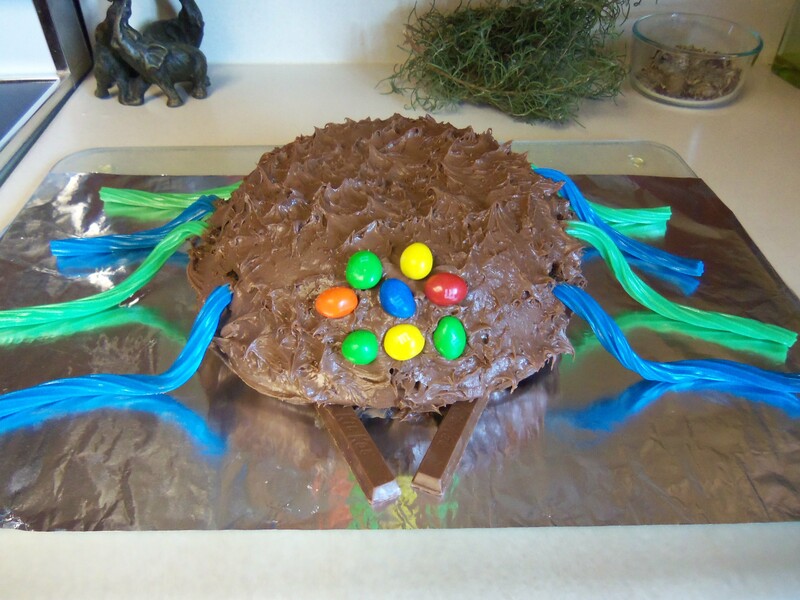 My kids usually ask me to make a cake that looks like some kind of insect, animal, robot, or star wars related theme for their birthday. 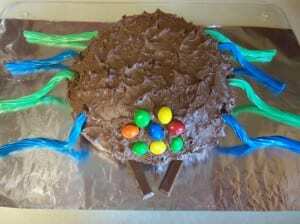 Being that I try to keep things simple and, to be honest, I don’t have the patience to make these elaborate beautiful cakes that some of my friends can make….this Chocolate Brownie Cake – Birthday Spider style – is what I came up with. It’s easy, took me less than 15 minutes to decorate, and the kids are over the moon happy about it. Mission accomplished!! This cake is chocolate chewy delicious, and if you decide to make your own spider, know that it goes well with Halloween as well. This particular child’s birthday is the week before Halloween, so it seemed like it fit right in. I’ll give you the chocolate brownie cake recipe and the decorating instructions. If you have other ideas for it, Id love to her them. Grease and flour a large, oven safe glass bowl (or if you are not making a spider, a 9in x 12in glass dish). Pour batter into bowl and bake in a 350 degree F for 25-30 minutes, or oven until fork inserted into the middle comes out clean. My cake took 40 minutes to be fully baked, but this will vary depending on the deepness or shallowness of your bowl. When the top started to get dark I put a piece of foil on top so it wouldn't burn while the thicker part of the cake finished baking. After the cake is cool, run a baking spatula around the edges as deep down as you can get. Place your hand on the cake and turn the bowl upside down over where you want your cake. It should come right out. Pat the icing with a spatula or fork to make the spider look hairy. Gently push twizzlers into the cake as legs. Place peanut M&Ms on the head for eyes.